The birthplace of baseball and Frank Sinatra is also the home of the oldest mechanical engineering school in the country, Stevens Institute of Technology. Founded in 1811 by Colonel James Stevens, as a quiet resort style getaway across the Hudson, a place where Manhattanites could escape the pressures of the big city. Stevens' ship, the Juliana, was the world's first commercial steam ferry, shuttling vacationers from New York City, across the Hudson River. Once an industrial community, Hoboken was home to Maxwell House Coffee, Lipton Tea and Hostess factories. Now, a residential community, Hoboken's residents include Lenny Kravitz, Natalie Morales, G. Gordon Liddy, Danny Aiello and Super Bowl MVP Eli Manning. According to the 2010 United States Census, there were 50,005 people, 25,041 households, and 9,465 families residing in the Hoboken. With just over 50,000 residents, the population density was 39,212.0 per square mile. The racial makeup of the city was 82.24% (41,124) White, 3.53% (1,767) Black or African American, 0.15% (73) Native American, 7.12% (3,558) Asian, 0.03% (15) Pacific Islander, 4.29% (2,144) from other races, and 2.65% (1,324) from two or more races. Hispanics or Latinos of any race were 15.20% (7,602) of the population. Nicknamed the "Mile Square City", although it actually covers about 1.25 square miles (3.2 km2) of land and an area of 2 square miles (5.2 km2) when including the under-water parts in the Hudson River. With a walkability rating of 95 (of 100) Hoboken is ranked among the most walkable cities in the United States, parking can be difficult and many residents don't own a car. Hoboken Lackawanna Terminal provides easy access to most NJ Transit train lines and the NYC/NJ PATH provides 24 hour service to Newark, Jersey City and New York City. The NY Waterway Ferry crosses the Hudson River to Manhattan from uptown and downtown locations. Situated between the Lincoln & Holland Tunnels, Hoboken is easily accessed by the New Jersey Turnpike (RT. 95). 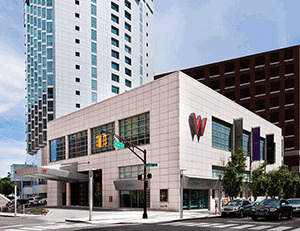 Within one square mile Hoboken offers upwards of 100 different bars & restaurants. Notable chefs include Buddy Valastro (Carlos Bakery), Anthony Pinot (Anthony Davids) and Douglas Gough (Brass Rail). La Isla's Omar Giner has appeared on the Food Network alongside Bobby Flay and Guy Ferrari. At the annual Mozzarella Festival, local Italian delis Vito's & Fiore's are the hometown champions. As of the 2012 school year, the district's five public schools had an enrollment of 1,730 students and 187.0 classroom teachers, for a student–teacher ratio of 9.25:1. Hoboken is also home to a number of private schools, including include All Saint's Episcopal Day School, The Hudson School, Mustard Seed School, Stevens Cooperative School and Hoboken Catholic Academy. Stevens Institute of Technology, founded in 1870, is located in the Castle Point section of Hoboken. Comprised of three schools and one college; the Charles V. Schaefer, Jr. School of Engineering and Science, School of Business, School of Systems and Enterprises and the College of Arts and Letters. With a total enrollment of more than 6,400 undergraduate and graduate students, Stevens is a member of the Empire 8 Conference, Eastern College Athletic Conference (ECAC) and NCAA Division III. Stevens is also home to three national research centers of excellence and joint research programs focusing on healthcare, energy, finance, defense, STEM education and coastal stability. Hoboken has many annual events such as the Frank Sinatra Idol Contest, Hoboken Comedy Festival, Hoboken House Tour, Hoboken Studio Tour, Hoboken Arts and Music Festival, Hoboken (Secret) Garden Tour, Mozzarella Festival and Movies Under the Stars. The Hoboken Farmer's Market occurs every Tuesday, June through October. There are also numerous festivals such as the Saint Patrick's Day Parade, Feast of Saint Anthony's, Saint Ann's Feast and the Hoboken Italian Festival. The Hoboken Public Library & Hoboken Terminal are known for their architecture, the terminal was designed by Kenneth MacKenzie Murchison. Hoboken has appeared in a number of major media outlets since 1841, when it was the central location in Edgar Allen Poe's "The Mystery of Marie Roget". Most famously, in Elia Kazan's 1954 Oscar Winning film On the Waterfront, Marlon Brando plays a Hoboken dock worker / mob enforcer who utters the famous line "Charlie, I coulda been a contender". In a classic 1960 episode of The Twilight Zone, fan favorite "The Mighty Casey", the Zephyrs baseball team are said to be from Hoboken, New Jersey in a narration by series creator Rod Serling. Today, TLC's Cake Boss is shot on location at Carlo's Bakery on Washington Street and Hoboken is home to the Macy's Parade Studio, which houses most of the floats for the famous Macy's Thanksgiving Day Parade in New York City. Take in the view of the gorgeous New York City skyline through enormous picture windows overlooking the Hudson River. Enjoy unparalleled amenities that include a waterfront promenade, fully equipped fitness and aerobics center, on-site parking, residents club, business center, on-site cafe, and daily shuttle service to the PATH. Or take an easy ride to all the dazzle and excitement of Manhattan and its world-class choices in dining, entertainment and culture. Welcome to Maxwell Place on the Hudson, Toll Brothers City Living’s luxurious new condominium residences and town homes in beautiful Hoboken, New Jersey. Offering breathtaking views of the Manhattan skyline, life at Maxwell Place is astonishingly convenient and richly rewarding. Maxwell Place offers condos for sale in Hoboken, NJ, just minutes from Manhattan. Maxwell Place, anchored on the Hudson River waterfront, is an elegant community that mixes luxurious condominiums, town homes, and convenient on-site retail with a beautiful waterfront park and walkway. This vibrant new community features world-class amenities including a rooftop pool & hot tub, fitness & health center, rooftop courtyard, and Club Maxwell — a private residents’ club. Luxury studio, 1-, 2-, and 3-bedroom condominiums and town homes are available for sale. The residences at W Hotel combine luxury living with hotel amenities. An iconic landmark on the Gold Coast Waterfront (between River St & Frank Sinatra Blvd) with a magnificent view of the New York City skyline. Hot nightlife, decadent dining, a Bliss Spa and shopping at your doorstep. Blocks from New York City transportation (NY Waterway Ferry & NYC/NJ PATH) and New Jersey Transit's waterfront transportation hub. One of the best views in the world, valet parking, world class dining and spa services in the lobby. The condo units at W Hoboken are modern and luxurious, many eastern facing units have balconies with views from the George Washington Bridge to the Brooklyn Bridges.